Les Dobbin developed a keen interest and talent for conducting while he was at the Faculty of Music, University of Toronto, majoring in voice with Louis Quilico and studying orchestral conducting with Victor Feldbrill, Margaret Hillis and Peter McCoppin. He began his career as a choral musician with Lloyd Bradshaw and professionally with Elmer Iseler. Les Dobbin taught as an itinerant music teacher for the Toronto District School Board (TDSB) for 33 years. He recently retired as director of the orchestra and bands at John G. Althouse M.S., where the school annually excelled at the Kiwanis Music Festival, winning the Colonel Peacock Trophy in 2002, 2003 and 2006 and the Mary Francis Arrigo award as top jazz performers in 2006. Mr. Dobbin is active as a clinician for the TDSB and Ontario Music Educators Association and as an adjudicator for the Kiwanis Music Festival. Mr. Dobbin has been appointed to the board of directors for the Toronto Kiwanis Music Festival. 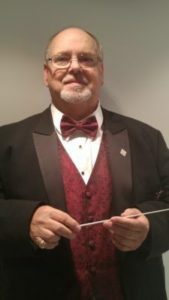 He was the conductor of the Concert Band at Inter-Provincial Music Camp for 10 years and for the past 30 years has been the Camp Director of the TDSB’s Toronto Summer Music Camp. Mr. Dobbin continues to conduct the prestigious Etobicoke Youth Band (EYB), enriching the musical lives of over 100 young musicians. Recently he collaborated with Robert W. Smith in a concert of Smith’s works at Koerner Hall, and with Ben Zander, conductor of the Boston Philharmonic Youth Orchestra. The band will celebrate its 35th anniversary in 2017. In 2014, he formed the Toronto Concert Band (TCB) in collaboration with Ken Hazlett. This ensemble, 75 strong, made its debut at the Glenn Gould Studio to great acclaim. As a founding musical director of the TCB, he has broadened his reach to further inspire musicality in adult musicians. Recently he was appointed the director of a new initiative, the Band Enrichment Program at the Royal Conservatory of Toronto. Mr. Dobbin is a member of Phi Beta Mu, International Bandmasters’ fraternity. He was nominated for the Award of Excellence as an employee of the Etobicoke Board of Education and as a community leader for the EYB in 1986 and 1997 and won the award in 2003 and 2015. In 2012, he was awarded the Queen’s Diamond Jubilee Medal for outstanding service to his community. Michael Samotowka joined the Etobicoke Youth Band in 1995 as a trumpet player and has since transitioned into his current role as Conductor and Band Manager in 1997. At the same time, Michael attended the University of Toronto Faculty of Music; where he has majored in Music with a Specialization in Music Education. Here is where he has developed a keen love for teaching and conducting. 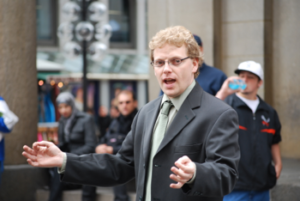 Since 2001, Michael has taught as an Itinerant Music Instructor for the Toronto District School Board (TDSB). Within that time, he has worked in various schools across the TDSB in Etobicoke and in downtown Toronto. Currently, he is the Director of the Bands and Co-Director of the Orchestra at John G. Althouse Middle School. Over his multiple years of teaching, he has led many ensembles to great distinction and success at the Kiwanis Music Festival both locally and provincially, as well as numerous TDSB showcase concerts. Michael has been associated with the Toronto Summer Music Camp since 1995. Michael was given the opportunity to work as a Counsellor, later leading to the position of Conductor; thus, leading to the transition of Assistant Camp Director in 2006. This is the role that he holds today. He has also worked as a Faculty Assistant at the Inter-Provincial Music Camp from 1999 to 2004 and later from 2008 to 2010 where is held the role of Director of the Jazz Band. As a trumpet player, Michael has performed with many groups in the Greater Toronto Area (GTA), including the Mississauga Symphony Orchestra, Etobicoke Philharmonic, North York Symphony Orchestra, Northdale Concert Band, Royal Conservatory Wind Ensemble, and the Toronto Concert Band. Michael has also performed as a soloist at many local churches during events such as Easter, Christmas, and Remembrance Day ceremonies. As an Arranger/Composer, Michael has written music for Stage Band and Jazz Choir, Concert Band, Orchestra and Choir and String Orchestra; this is including numerous performances of his works at the annual TDSB Spring Festival Concert at Massey Hall. Importantly, Michael was asked to arranged the “Music Monday” String Orchestra version of ‘Our Song’ in both 2007 and 2008, which celebrated not only music, but music education across all of Canada.